The city’s Ethics Commission fined Phil Rath, board chair of Civic San Diego, $11,000 for his failure to disclose his financial relationship with a developer that won a competition to build a $47 million project in southeastern San Diego, and a $5.8 million loan from city affordable housing funds. Rath also failed to recuse himself from two votes related to the project. Rath received $100,000 from the developer 10 months earlier. A leader of San Diego’s redevelopment arm voted to give a developer the right to build a $47 million project in southeastern San Diego, and a $5.8 million loan from city affordable housing funds 10 months after being paid $100,000 by the same developer. On Thursday, the city’s Ethics Commission fined Phil Rath, board chair of Civic San Diego, $11,000 for four violations of the city’s municipal code related to his failure to disclose his financial relationship with the developer, Affirmed Housing, and for his failure to recuse himself from two votes related to the project. The stiff penalty – the chair of the Ethics Commission called the violations “egregious” and said they violated the cornerstone of the city’s ethics laws – is the latest in a string of public problems for Civic San Diego, a nonprofit corporation that handles redevelopment projects for the city but which has been fighting to survive for nearly three years. The agency parried a state bill to effectively shutter the agency, is being sued by a former board member, has seen multiple whistleblowers allege improprieties within the agency, spent over $30,000 investigating those allegations and saw its former president abruptly resign earlier this year. Rath’s ethical transgressions were related to a long-sought after plan to develop 8.5 acres of city-owned land in Encanto into 150 homes, including 111 reserved for low-income residents, an acre of open space and commercial space. Civic San Diego led the selection process for a developer, and ultimately chose between three final bids and awarded them city funds to make the project financially viable. Rath was appointed to Civic San Diego’s board in July 2015, seven months after he lobbied the county on Affirmed Housing’s behalf for a different affordable housing project. He received his first payment of $22,000 in December 2014, and the rest of his payment was deferred until months later. Rath included that lobbying work in a disclosure submitted to the county, but failed to do so when he joined Civic’s board. He was required to do so, because Affirmed was engaged in land use and development in the city. That was his first offense. Rath’s company, Rath Miller, then received another check from Affirmed for $100,000 in August 2015. But when he filed his annual statement of economic interests for the city the following January, he again failed to disclose the relationship. That was his second violation. Then Civic San Diego took up the selection process on the Hilltop-Euclid project in June 2016. Rath participated in a committee hearing that month to select Affirmed’s bid and go into closer negotiations with the company. City officials aren’t supposed to participate in any decision regarding a person or entity from which they received over $500 within the previous year. Not only did Rath participate in the meeting, and vote for Affirmed’s bid, he also spoke on the project’s behalf. “I do believe that the Affirmed project is the best option for this organization,” he said. Three weeks later, when the full board held a hearing, Rath participated and again spoke up on the project’s behalf. “It’s clear that this is the winner of this contest,” he said of Affirmed’s bid. In a statement, Rath said he cooperated with the Ethics Commission throughout its investigation. Rath’s transgressions first became public in November 2017 through a legal threat filed by San Diegans for Open Government, a nonprofit group that often sues the city and is regularly represented by attorney Cory Briggs. SDOG found Rath’s old county disclosure including Affirmed and argued he should have recused himself from the city vote. The City Council was scheduled to finalize the development deal that day, but punted the decision to investigate the allegations. At the time, Rath dismissed the allegations and said SDOG was wrong. “The basic problem with the letter is that it presumes I have an ongoing relationship with Affirmed Housing, which is not true,” he told Voice of San Diego at the time. It’s true, based on the Ethics Commission’s investigation, that he didn’t have an ongoing financial relationship with Affirmed at that time. But he failed to mention that he had received $100,000 from the company after being seated on Civic San Diego’s board and within 12 months of his votes to award the company a major redevelopment project. Briggs had a simple response: We told you so. Briggs said the Ethics Commission should forward the issue to the district attorney for criminal prosecution. “This sounds like a knowing violation of Government Code 1090, for which he should be criminally prosecuted,” he said. In March, Civic San Diego rescinded the votes in which Rath participated, washing its hands of the project and setting up the Council to make a final decision while pretending Civic San Diego had never been involved in the matter at all. In June, the Council did just that, and approved the development agreement and funding allocation with Affirmed – but technically without any official recommendation from Civic San Diego. 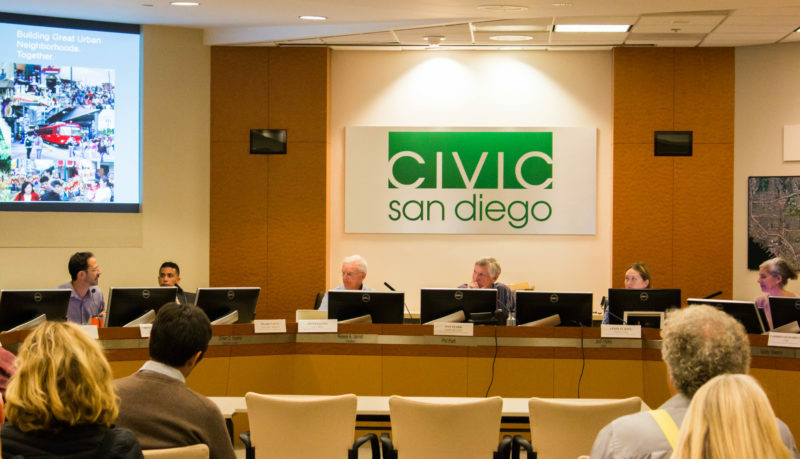 Civic San Diego also doesn’t have final decision-making authority – the votes Rath participated in were formal recommendations to the City Council, and the Council could still have overruled them. Stacey Fulhorst, executive director of the Ethics Commission, said it was a relevant factor that Civic’s votes weren’t final. Cabrera said the Ethics Commission found four violations, but they all flowed from Rath omitting Affirmed on his first disclosure because he was only thinking of people he worked with in the city, not the county. That’s because the decisions passed by more than a one-vote margin in each instance, but Fulhorst said the fact that Rath’s votes weren’t decisive was not relevant. The city attorney’s office has determined that the project approval is not in jeopardy, because Civic San Diego rescinded its votes. Briggs said he needs to look at the matter more closely, but “normally the fact that a public agency erased its recommendation doesn’t remove the taint” that the violation cast on the city’s selection. He said Civic San Diego should insist that Rath resign over the violations. Rachel Laing, a spokeswoman for Rath, said he has not considered resigning. Andrew Malick, an architect-developer with Malick Infill, was part of one of the unsuccessful teams that bid on the Hilltop-Euclid project. He said there needs to be some sort of reform in picking developers for public projects in San Diego generally. “I don’t know what that looks like, honestly, but this news seems to indicate that it’s not working,” he said. Malick said that unless Civic reforms its process, the revelations about Rath’s ethical violations would deter him from participating in any future Civic San Diego bidding processes.